Chuck Stewart, one of the most prolific and admired photographers in jazz — an intimate chronicler of many of its icons and milestones, including the historic recording session for John Coltrane’s A Love Supreme — died on Jan. 20 in Teaneck, N.J. He was 89. His death was confirmed by his daughter-in-law Kim Stewart, who has handled the licensing of his images in recent years. Over a distinguished career that spanned more than 70 years, Stewart shot countless artists in profile and at work, capturing resonant and unguarded images that also tell the story of the music. By his estimate, he shot the cover images for more than 2,000 albums, including a large portion of the Impulse! catalog. He also contributed photographs to a range of publications, including Esquire and the New York Times. 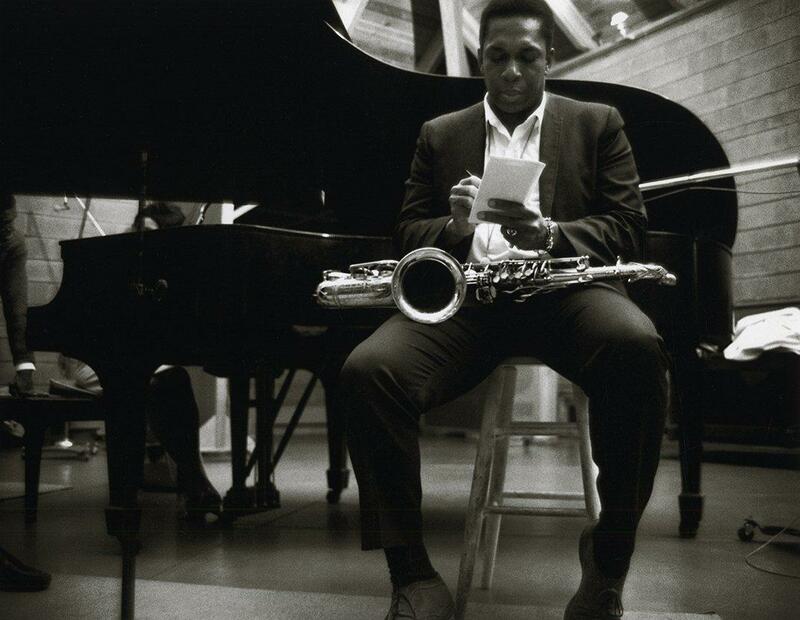 John Coltrane during the session for A Love Supreme, 1964. Reproduction elsewhere is prohibited. Charles Hugh Stewart was born in Henrietta, Tx. and raised in Tuscon, Az., where he received a Box Brownie camera as a gift on his 13th birthday. It wasn’t long before he put it to professional use, photographing the great opera singer Marian Anderson during her visit to his school. He sold prints to teachers and his fellow students for two dollars apiece. He attended Ohio University, one of the only colleges in the country to offer a fine arts degree in photography. It was there that he met the older photographer Herman Leonard, who fast became a mentor and friend. Eventually Stewart inherited the studio, carrying on Leonard’s legacy in his own language. His images often incorporate darkness as a backdrop, setting up the subject in dramatic relief. Last spring a gallery exhibition of his work ran at WBGO, and he spoke with Doug Doyle about his life and career. He has also exhibited at Jazz at Lincoln Center, and published a collection called Chuck Stewart’s Jazz Files, on Da Capo Press. Among the honors he has received are the Milt Hinton Award For Excellence in Jazz Photography. He is survived by a daughter, Marsha Stewart; two sons, David and Christopher; seven grandchildren; and one great-grandchild. Stewart was also an avuncular hero to many photographers, who received his counsel and his blessing. One of these, Carol Friedman, shares her tribute below. 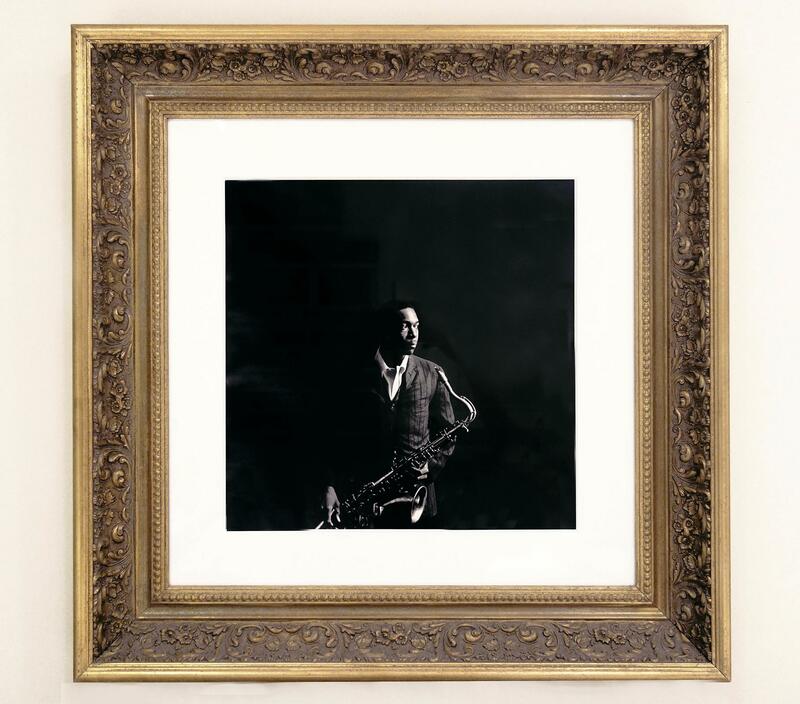 A portrait of John Coltrane by Chuck Stewart, framed in Carol Friedman's home. I was absolutely devastated to learn of the passing of master photographer Chuck Stewart this past Friday. Chuck was a sublime artist and a sublime man. He was so very dear to me. 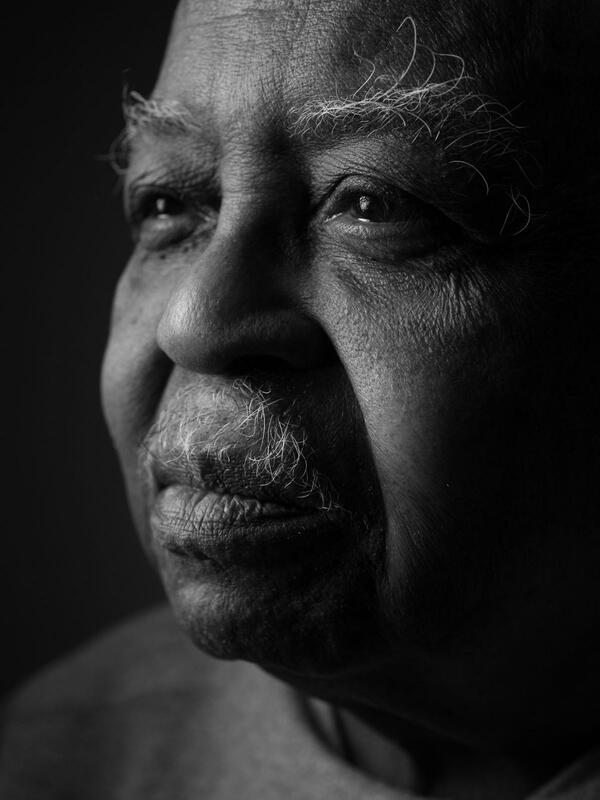 One thing is abundantly clear when you look at Chuck's photographs: his subjects loved and trusted this man. In the pantheon of jazz imagery, I cannot imagine anything greater than his portrait of John Coltrane. I have many photographs in my home, but this particular image hangs as a shrine, not only to Trane, but to a spirit world that seldom makes its way onto a two-dimensional surface. This level of emotional access is not easily or often granted. Chuck did not have have to ask. It belonged to him by virtue of who he was. I knew and loved many of Chuck's magical pictures long before I knew Chuck. I don't remember where or when we met, but we became fast friends. I was stunned and flattered by his admiration of my work. 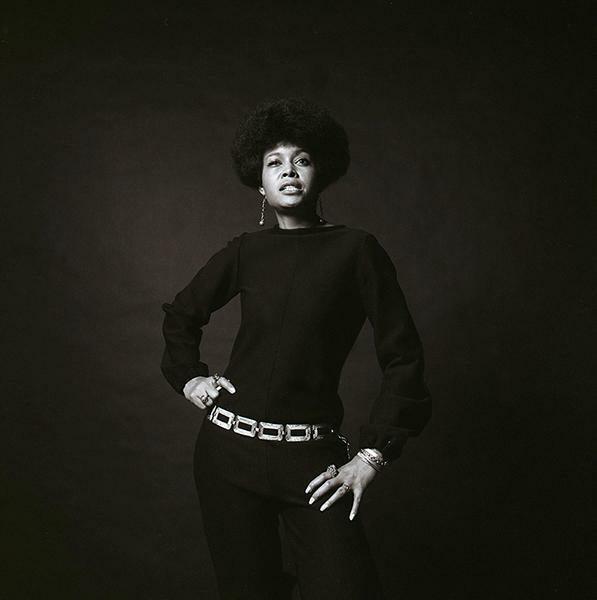 When I was researching pictures for my film on Abbey Lincoln, I asked if he had any never-before-seen pictures of her. Chuck generously opened his entire archive of images to me, with no limitations or restrictions whatsoever. I am so thankful that I took the #67 bus to Teaneck just a few months ago to show Chuck a rough cut of the film. I wanted him to see the extent that his beautiful images informed the film's tenor and aesthetic. In addition to the many stunning portraits of Abbey and the images of Max and Abbey in various recording sessions, Chuck's photographs of their wedding day offer a precious interlude: a scrapbook of tender and rarified history. Through his brilliant eyes. Chuck got his start in the record industry as Herman Leonard's assistant and quickly ascended. When Herman decamped to Paris, he gave his studio to Chuck and that was that. Through the years, Chuck shot thousands of album covers for a wide-ranging collective of music icons, from Ellington to Judy Garland to Sinatra to Ray Charles to Coltrane, Monk and Mingus. He told me that given how fast and furious it all happened, he fell into the practice of providing the record labels with only what they needed — a cover and two publicity photos — and would then move on to the next job. He never looked back. When I went through his contact sheets of Abbey and Max, I realized the degree of his genius. His greatest images had never even been printed. Chuck was sweet, funny, wise, generous and nobody's fool. He always spoke his mind, and although gentility was not a hallmark of his delivery, his brutal honesty and fabulous, mischievous spirit was. I feel so very privileged to have been his friend, comrade and the fortunate recipient of his love, respect and generous heart and soul.